My Foreign Policy colleague Josh Rogin is covering the substance of Hillary Clinton’s congressional inquisition. Watching it, I’m struck by the division between two kinds of Republicans. Group One has questions about the timing of the Benghazi attack, what the State Department could have done to prevent it, what it can do now. Group Two wants the truth, damn it, about the talking points that Susan Rice used on the Sunday shows after the attacks. Sen. Ron Johnson, a plainspoken member of the class of 2010, was more aggressive. Why hadn’t the State Department interviewed survivors from the attacks immediately, to find out whether people were beseiged by a protest or by a terror attack? “Senator, when you’re in these positions, the last thing you want to do is interfere with any other process going on,” Clinton said. “I realize that’s a good excuse,” Johnson snarked. Johnson pressed her again on the Talking Points. 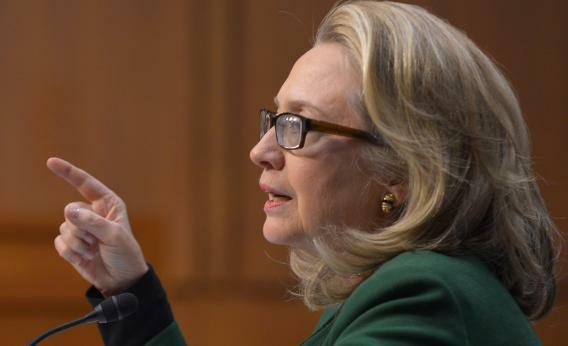 “What difference does it make now?” said Clinton, exasperated, cutting the air with her hand. But the shaming continued. “After [Rice] testified,” said Sen. Jeff Flake, “it was clear that what she testified to was at variance with the State Department.” Sen. John McCain reminded the room of the Sunday shows, and what he himself had said on the shows. Clinton shrugged. “We have a disagreement about what happened and when it happened, when it came to explaining the sequence of events.” McCain’s issues, she suggested, could be explained if he studied a bit more. “We had no access to the surveillance cameras for weeks,” she said. “I would urge that you look and read both the classified and unclassified versions” of the reports.